IT'S HERE! 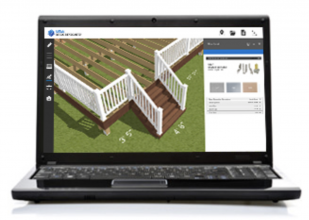 Take a look at our new DECK VISUALIZER to see what a wonderful outdoor living space you can create with it. 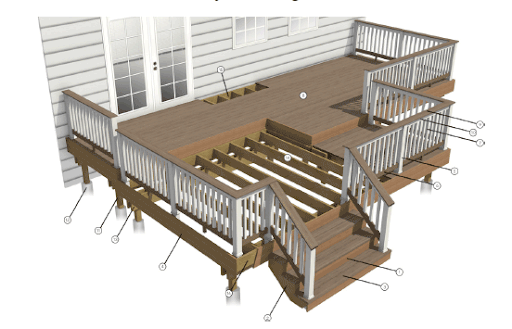 This new intuitive deck tool allows you to design your own custom treated wood deck complete with on-trend railing designs and color stain options to complement your home. With the new tool, you can also register to print and save your designs. 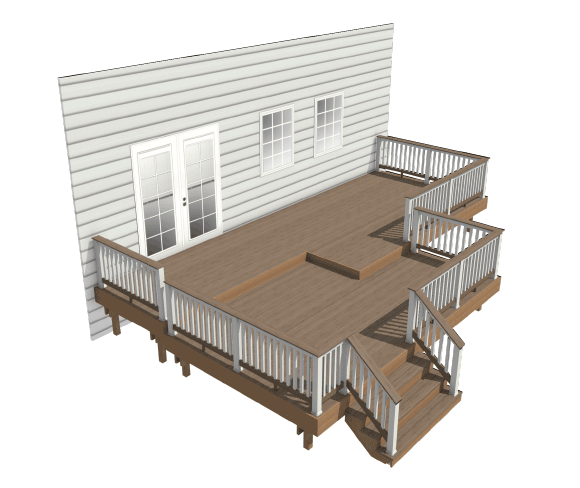 Our deck visualizer will also provide you with a material list so that you will know just what to buy when building your dream space right outside your own back door. Now, let your inner designer out and see what your imagination can create! Java 1.4 and Adobe Acrobat 3.0+. If you do not have these applications, you may be prompted to download them. Adobe Reader: Adobe Reader 5.0 or higher to open and view the finished design. The latest version of Adobe Reader can be downloaded here. When cutting or drilling wood, always wear eye protection to prevent injury from flying wood particles. If cutting pressure treated material, a fabric breathing mask will help to avoid ingestion of wood dust. Wear gloves as the surface is rough and can cause splinters. For outdoor projects, use building code approved, corrosion-resistant fasteners and connectors suitable for use in pressure treated wood. Use hot-dipped galvanized or stainless steel fasteners. For connectors, use G185 hot-dipped galvanized for exterior use. Predrill holes near the ends of boards to help prevent splitting. Install fasteners flush to the wood surface. Do not overtighten fastener. Invest in a pair of kneepads if you are working on a floor or deck. Dispose of scraps in the regular trash or take to a landfill - never burn. The checklist provided should be used as a quick guide only and we would highly recommend consulting some additional supplemental resources listed here: www.strongtie.com/products/deckcenter. Concrete Work - Pick, Post Hole Digger, Shovel, Wheelbarrow, Hoe and Hose (to mix concrete), Tamper. Concrete Layout - Stakes or Batter Boards, String, Transit. Safety - Eye Protection, Hearing Protection, Gloves, Dust Mask. Wood Layout - Tape Measure; Squares, Rafter/Speed, Framing; Levels; Chalk Line; Pencils; Plumb Bob. Wood Work - Extension Cord, Circular Saw, Drills and Bits, Hammer, Nail Set, Chisel, Handsaw, Ladder, Mallet, Toolbelt. Risers, Stringers, Treads, Fascia, Rail Post, Bottom Rails, Infills, Decking, Rail Cap, Top Rails, Post, Footing, Beams, Joists, Ledger, Rim Joist. Concealed Stringer Hanger, Slant Nail Joist Hanger, Deck Tie Back, Rafter Tie, Stair Angle, Higher Capacity Post Anchor, Higher Uplift Post Anchor, Adjustable Deck Tension Tie, Inverted Flange Joist Hanger, Post Cap, Post and End Post Cap, Rafter Tie. Always make sure to use Hot-Dip Galvanized, Stainless Steel, or other corrosion-resistant finished fasteners that are recommended for the wood you are using. 1. Risers: The vertical boards attached to the stair stringers. Many localities require risers to prevent possible trip hazards. 2. Stringers: The structural support for stairs. They have limits on how much weight they can carry, so size and spacing are important considerations. Composite manufacturers provide recommended stringer spacing to support the tread material. 3. Treads: The horizontal stair surfaces on which deck users walk. 4. Fascia: Vertical boards that face outwards from the edges of the deck, attached to the rim joists. Fascia boards typically consist of a lumber species that matches the appearance of the decking material. 5. Rail Post: Vertical lumber member that supports the handrail and resists the outward force of people leaning on the railings. 6. Bottom Rails: Lumber members that connect to the rail posts and provide a solid surface for securing the infills. 7. Infills: Also known as balusters or pickets, the infills are connected to the top and bottom rails and provide a barrier against falls. 8. Decking: When properly attached to each joist and rim joist, the decking surface (whether wood or composite material) helps unify the entire structure. 9. Rail Cap: Much like the decking, the rail cap unifies the railing system and provides a decorative feature. 10. Top Rails: These members have the same stabilizing function as the bottom rails. 11. Post: The vertical structural member that supports the beams and attaches the deck to the footings using a post base. 12. Footing: The concrete element that serves as the foundation of the deck. 13. 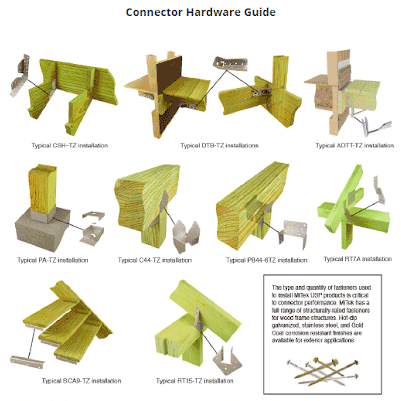 Beams: Structural members that support the decking floor joists. Beams are often made of a solid lumber like 4x or 6x, or they are installed by doubling or tripling a 2x. It is important to have a post of sufficient size and strength to support the beam. The beam should not be any wider than the thickness of the post and should be secured with the correct post cap. 14. Joists: Wood members installed across the beams and spaced to accommodate the decking material. The joist spacing may depend on the angle at which the deck boards are applied. 15. Ledger: The ledger is a crucial connection because it attaches the deck to the house. The material used to construct the house may determine the type of connection. Consult local building officials on the recommended connection. 16. Rim Joist: Also known as edge bands. The rim joist wraps the deck and keeps the joists standing on edge while also providing a solid surface for attaching railing posts. 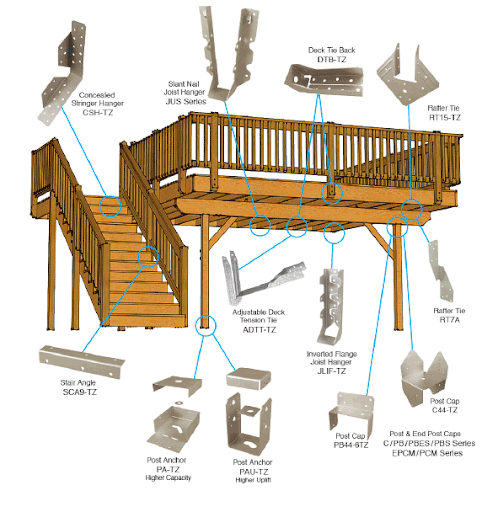 Proper attachment is critical to installing a safety railing.